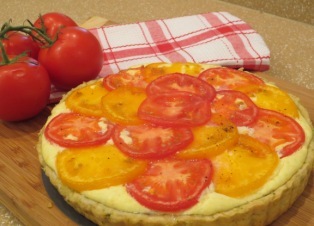 This is a savory vegetarian tart with a ricotta and Parmesan filling and topped with slices of fresh ripe tomatoes. The tart dough is very flaky and flavorful, and flecked with green from the addition of basil leaves. It is great for a lunch or brunch, or serve it as a first course for dinner, followed by something light, such as pasta with lemon and tuna sauce, or as a main course with a vegetable or green salad. Put the basil and garlic in a food processor; process until finely chopped. Add the flour and salt; pulse several times to combine. Add the butter; pulse about 10 times or until the mixture looks like coarse crumbs. With the machine running, add the water, one tablespoon at a time. Stop adding water when the mixture comes together in a ball. Remove the dough, flatten into a disk, and wrap in plastic. Refrigerate for at least one hour. Roll the dough on a lightly floured surface into an 11-inch circle. Place the dough over the tart pan; gently press it into the bottom and sides. Trim the dough even with the top of the pan. Prick the dough all over with a fork and line with a piece of aluminum foil. Fill with dried beans or pie weights. Bake for 15 minutes. Remove the foil and pie weights and bake for another 10 minutes. Remove from the oven; leave the oven on. 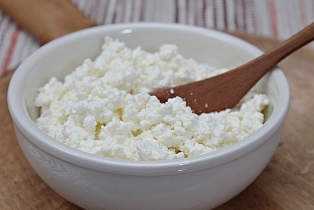 Combine the ricotta, Parmesan, eggs, salt and pepper in a bowl. Pour the mixture into the prebaked pie crust. Arrange the tomato slices on top of the cheese filling. Bake for 35 to 40 minutes, or until the filling has puffed slightly and the top is set. Cool on a wire rack. Serve warm or at room temperature. A traditional tart pan with short fluted sides and a removable bottom makes unmolding easy. But have you ever wound up wtih the still-hot ring looped around your arm? Try resting the pan on an over-turned bowl; the rim will slip down away from the crust. Then use a metal cake server to loosen the tart from the bottom and lift it onto a serving plate.